As I get older, I find it fascinating how I remember some things from my past so vividly, while other seemingly important experiences have completely faded from my memory. Eating my first scone as a child I remember it like it was yesterday. We had flown to England to visit my grandparents who lived in Yeovil, and they had taken us on a day trip to explore Bath. In the afternoon we stopped at a restaurant for tea and scones. Small round scones were served on a pretty tiered cake stand, alongside pots of jam and a bowl of Devon cream. I remember splitting my scone in half and spreading each half with jam and lots of clotted cream. I couldn't stop eating them. The combination of a soft and flaky scone with sweet jam and the wonderful creamy richness of Devon Cream was delicious. And forever after, I like to eat my scones with jam. So I decided to make a scone that has the jam baked right inside the scone. No more cutting the scones in half and spreading them with jam after they are baked. They are great to eat on-the-go. And of course, they are excellent with a dollop of Devon Cream on top. Scones are easy to make. I don't use a mixer. I simply mix the dry ingredients together, cut in the butter, and then stir in the wet ingredients. It is important not to over mix the dough as you don't want a tough scone. Use cold butter and you can "cut" the butter into the flour mixture using a pastry blender, two knives, or even your fingertips. You can fill the scones with any flavor of jam or preserves, and it can be homemade or store bought. I have used my Homemade Raspberry Jam in this recipe which has a lovely tart and tangy raspberry flavor with just the right amount of sweetness. It is so easy to make and since this is a Refrigerator Jam there isn't any canning involved. 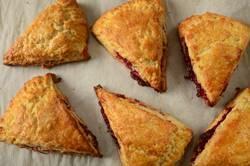 Scones: Preheat your oven to 400 degrees F (200 degrees C) and place oven rack in the center of the oven. Line a baking sheet with parchment paper. In a large bowl, whisk together the flour, sugar, baking powder and salt. Cut the butter into the flour mixture with a pastry blender or two knives. The mixture should look like coarse crumbs. In a bowl whisk the cream with the beaten egg and vanilla. Add this mixture to the flour mixture. Stir until the flour mixture is moistened and a dough is starting to form. Do not over mix. Transfer to a lightly floured surface and knead dough gently four or five times and then divide the dough in half (about 290 grams for each half). Pat or roll each half of the dough into a circle that is about 8 inches (20 cm) round. Egg Wash: In a small bowl whisk the egg and cream. Bake for about 18 minutes or until golden brown and a toothpick inserted into the center of a scone comes out clean. Remove from oven and place on a wire rack to cool. If desired, garnish with a dollop of Devon cream or softly whipped cream. These scones are best the day they are made, but can be stored at room temperature for a couple of days or they can be frozen.